Building your deck according to code makes it safe. According to , about half of the 40 million decks in the United States are not code-compliant. Improperly built decks can shift or collapse, injuring people in the process and causing damage to houses and other structures. Building codes are in place to ensure safety, and virtually every state and municipality enforces codes for deck construction. Most jurisdictions follow the International Building Code, which devotes one section—R507—to deck construction. Some building departments also publish their own codes which may differ somewhat from the IRC. The first step in deck construction is to draw up a plan, and the second step is to submit that plan to the local building authority and obtain a building permit. After construction of the deck, you must get it inspected to ensure compliance with applicable codes. If you aren't working with a contractor familiar with the codes, it's a good idea to study section R507 of the IRC as well as the codes published by your local building department. Some requirements may surprise you, and if you fail to follow them, your deck won't pass inspection. Footings must sink below the frost line. After you've laid out the perimeter of the deck, it's time to set the footings, which support the posts that in turn support the deck. Each footing must be capable of supporting 1,500 psi load pressure, and the code specifies minimum width and thickness depending on the beam and joist span. You can size your footings by consulting Table R507.8 of the Code. For example, if you're installing square footings, they will have to be at least 21 inches wide and 9 inches thick if your beam spacing is less than 8 feet and the joist span is between 14 and 18 feet. Circular footings, on the other hand, need to be 23 inches in diameter. The footing sizes also depend on the load-bearing capacity of the soil and the live load the deck must support. 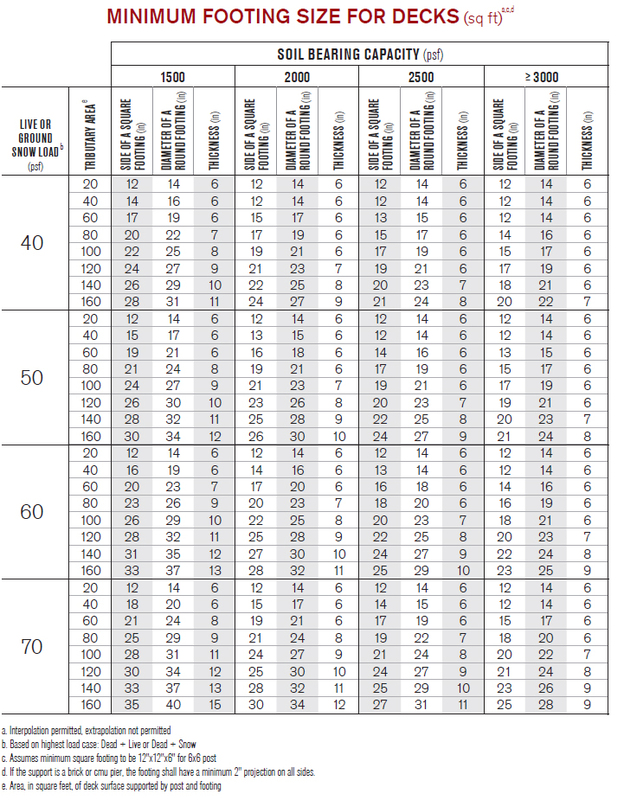 A new table in the 2018 version of the IRC, Table R507.3, specifies footing size as it related to soil composition and live load. Footings need to be at least 12 inches below settled soil to prevent lateral movement. In addition, they need to be dug below the frost line, which varies according to climactic zone. In Florida, where frost seldom occurs, some local authorities may allow you to place your footings on grade, but in cold states such as Minnesota, you may have to dig down 48 inches or more. When setting footings on a slope, the rule of thumb is to dig them at least deep enough so that the horizontal distance from the bottom of the hole to ground level on the downward slope is at least 7 feet. This depends on the soil characteristics, however. When in doubt, consult with a soil engineer before digging. Use properly treated wood for structural members. Any wood incorporated into a deck structure that is in ground contact must be treated with a preservative to protect it from decay, and it must be labeled as such. 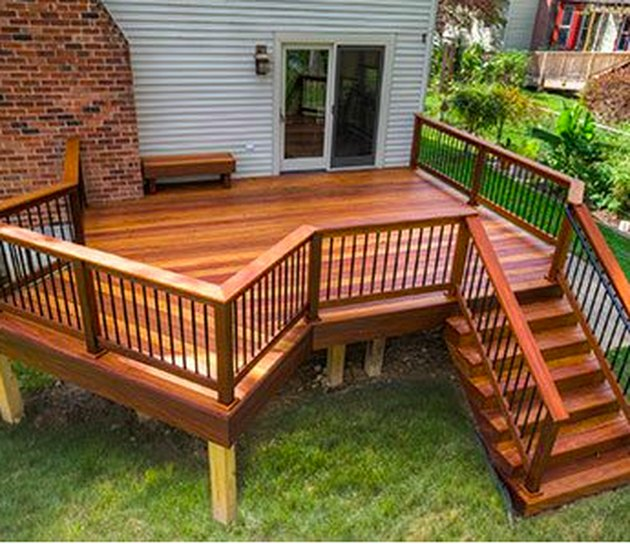 Commercially available pressure-treated wood fulfills this requirement, and most builders use this type of lumber for the entire infrastructure of a deck. Posts must be attached to the footings with appropriate fasteners to prevent lateral movement as well as uplift. You do not have to use fasteners, however, if the post itself is buried to a depth of at least 12 inches. 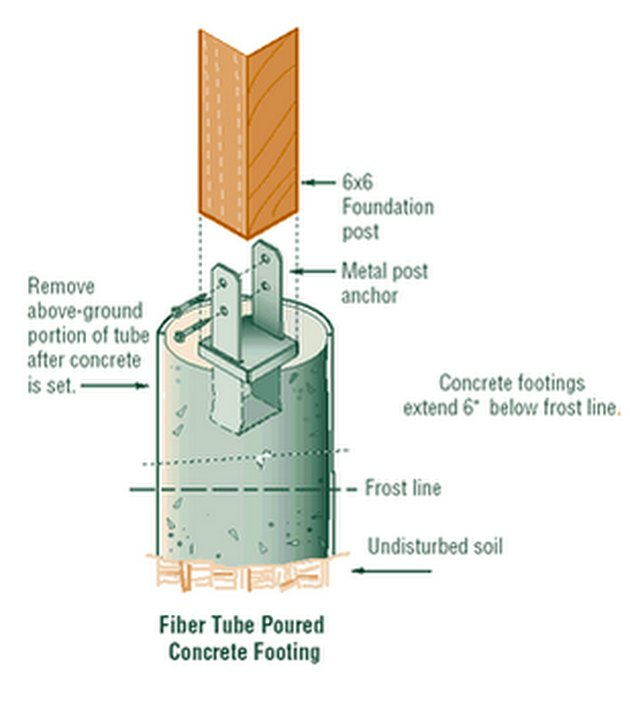 If you set the posts on top of concrete footings, even precast ones, you must secure them with positive hardware connections. You can use 4 x 4 posts up to a maximum length of 10 feet and 6 x 6 posts up to a maximum length of 18 feet. The IRC no longer allows the use of dimensioned 4 x 4 or 6 x 6 lumber for the beams or girders that rest on the posts and provide the support for the joists. Instead, your beams or girders must use multiple layers of 2 x material. For instance, instead of using a 6 x 6 beam, you can fasten together three layers of 2 x 6 lumber. The size and span of the beam you need depend on the span of the joists they support. You can look up this information in IRC Table R507.6. 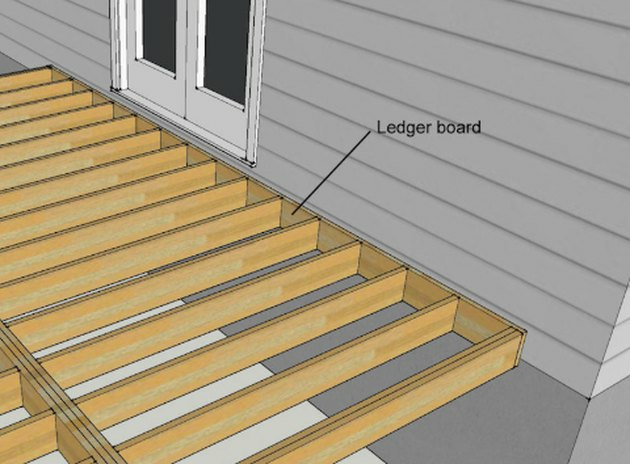 You need a ledger board when attaching a deck to a structure. It's common to attach a deck to the side of a house or other structure, and when you do this, you need to support it with a ledger board. The ledger board must by 2 x material with a width equal to or greater than the width of the deck joists. You must attach the ledger board to the floor framing behind siding using through-bolts and washers or 1/2-inch lag screws. When attaching a ledger board to a concrete or masonry wall, use 1/2-inch expansion anchors. The fasteners must be spaced in accordance with Table R507.9.1.4. You must use joist hangers to attach the joists to the ledger boards, and the two outer joists must be secured to the floor joists on the other side of the wall with hold-down rods capable of withstanding a lateral tension of 1,500 pounds. Rim Joists are an IRC requirement. Joists for your deck must be supported either by hardware, such as joist hangers or post caps, or notched posts. When supporting a joist on a notched post, the notch must be wide enough to accommodate the entire thickness of the joist. Joist span length and spacing is a function of joist size—the requirements are presented in IRC Table R507.5. The maximum cantilever allowed—the amount the joist can overhang the beam or post—is 1/4 the total joist span. The code requires covering the ends of the joists with a rim joist that has the same width and thickness of the joists themselves. It must be secured to the end of each joist with three #10 x 3-inch screws or nails. The IRC specifies that decking boards must be made from 2 x 6 lumber or composite boards with a minimum spacing of 1/8 inch between boards. Many localities allow the use of 1 1/4-inch ipé or teak boards, but it's best to check first. 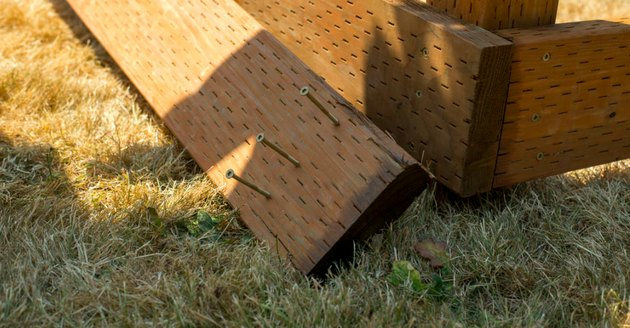 Each decking board needs to be attached to each joist with two 8d nails or two #8 decking screws. 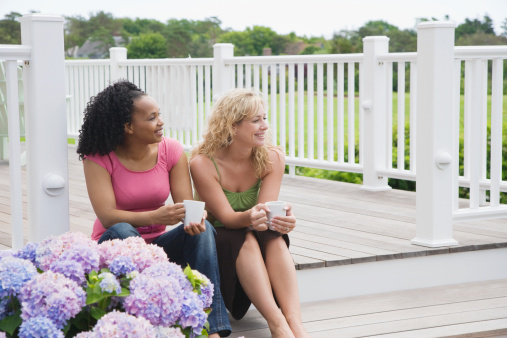 Every deck higher than 30 inches, whether it's free-standing or not, must have a railing. The railing must be at least 36 inches high, and it must include balusters that are no more than 4 inches apart. Each guard post supporting the railing must be attached to the rim joist with two 1/2-inch through-bolts and hold-down anchors capable of withstanding 1,800 pounds of force. Stringers should be attached both at the top and bottom of the staircase. According to Section R311.7.5, you must provide a landing for any stairway that rises higher than 12 feet. The landing should have the same width as the stairway and extend 3 feet in the direction of travel. The landing should construct it as a free-standing deck, with all the appropriate footings, beams, joists, and bracing. You can construct sawn (notched) stringers for a stairway using 2 x 12 lumber. Make the throat width— the distance between the tread depth and the edge of the stringer—no less than 5 inches. The maximum horizontal span of for a stairway made from sawn stringers is 7 feet. You can also construct solid stringers by attaching metal tread supports to 2 x 12 lumber. These unsawn stringers can extend a maximum horizontal distance of 16 feet 6 inches. Support stringers to the deck at the top by angled joist hangers and at the bottom by footings. The IRC specifies that stair treads should be constructed from 2 x 6 lumber. If the treads are 36 inches long, you can support them with two solid stringers, but if you're using sawn stringers, you'll need three. Even if you're pretty sure you have a handle on code requirements, it's important to check with the local building department before you start construction. 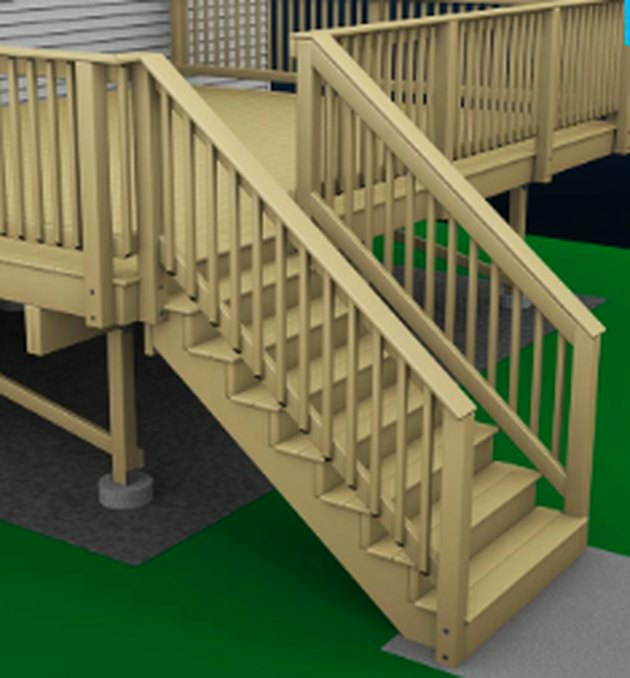 Many states and localities have variance, easement and egress requirements that could prevent you from placing the deck in your ideal location. There may also be setback requirements of which you aren't aware. Some communities even regulate such details as the style of deck you're allowed to build or the color.